I took the boat with the bamboo outrigger to the lake yesterday... as I got closer to the lake the sky got darker. I got there about 15 minutes before the rain... got the boat rigged and waited for the rain to pass. When it stopped there was not much wind but I did get a few puffs to see how the rig responded. One thing is for sure... it needs a full time lee board. More rudder area would be a big plus as well. I had a Hobie kayak sail on it and this boat is set up to tack. This boat has always been a little hard to turn and with the outrigger on it.... its even more so. I got enough wind to see that it want take much to lift the outrigger out of the water. It is still fairly light in its unfinished state with no permanent attachment. It was held on by bungee cords. 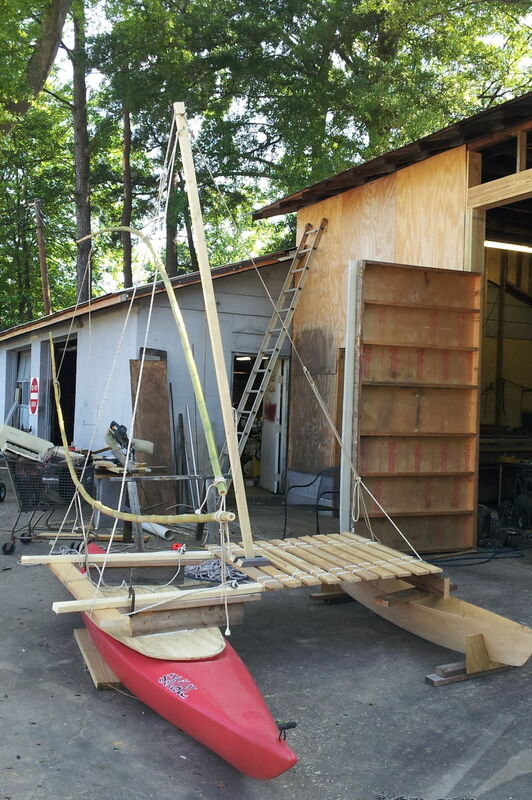 You could paddle very hard without worry of capsize given the added stability of the outrigger. The outrigger did not seem to have much drag once paddling. If it had not been for the bungees around the hull holding it on it would have been very quiet too. I was going to take some pics but I was still getting rained on a little and my cell phone was so wet it couldn't sense me touching the go button. Of Polynesian decent... this rig pretty much develops its distinctive shape just by putting some bamboo yards onto the rig and hoisting it while hold the lower yard down. A small rope holding the small end of the bamboo yards. helps establish the crab claw shape. It efficiency rivals that of the most modern rigs rigs around. This is a shunting pacific proa where the boat can sail in either direction. The ama or small outrigger will always be on the upwind side... most proas have pretty small amas. 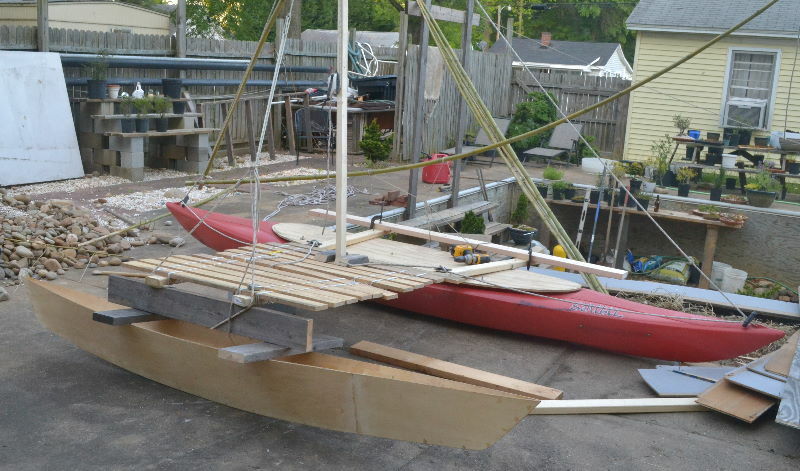 I would say this one is rather large compared to the main hull but I wanted to allow for supporting a person out on the outrigger frame. We shall see... thats what sea trials are for and hopefully that is not too far away. 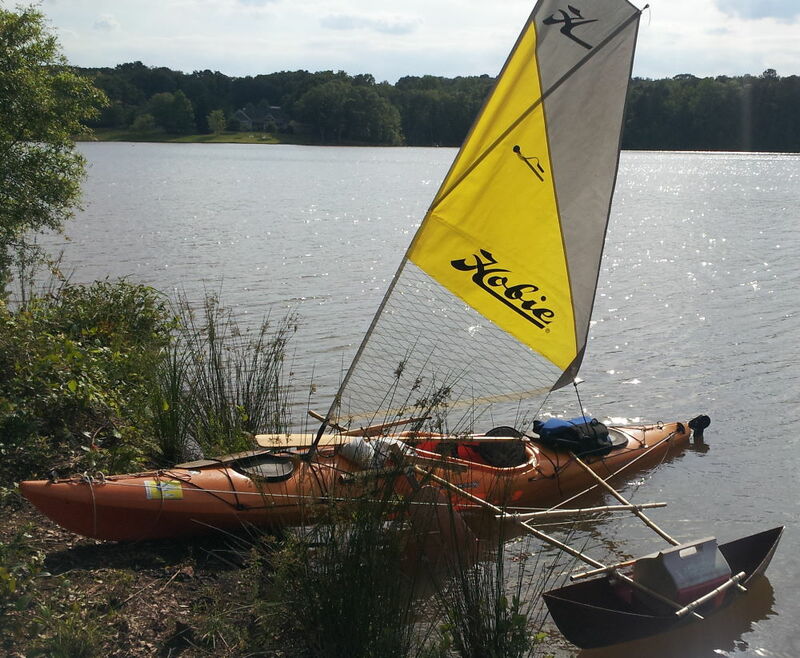 My interest in proa’s finally got the best of me and as a first step decided to add an ama to a plastic canoe/kayak. While built like most of today’s plastic kayaks this is more of a canoe form. It was desiged to paddle in one direction as a single and the other as a double so the hull shape should work ok as a vaka on my hybrid shunting proa.